• If you need graphic work done for the logo or the placement on the tags we offer a service where we can create the logo or help design the card. 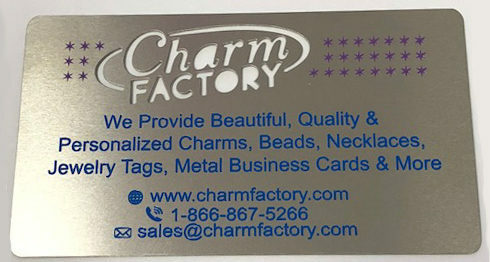 Email sales@charmfactory.com for more information. 3. Would you like information on the back of the card as well? 4. Would you like a specific part of your logo cutout? • Looking to make more of a statement? Adding the cutout will allow for a unique focal piece. 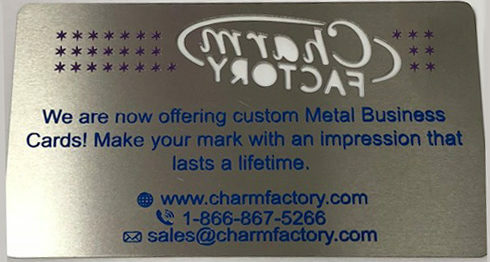 These cards are great when you are looking to make a lasting impression. 5. Place your order and we will begin processing your order. These cards will take about 2-3 weeks for production time (does not include shipping time).